This uploader will allow you to not only upload larger LOs, but multiple LOs at once. If your browser supports it, you can click and drag files from your desktop into the panel where it reads "Drag files here." 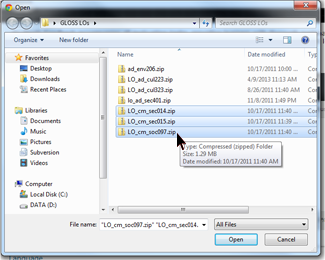 You can also open the browse dialog by clicking on "Add Files" on the bottom left. If you clicked "Add Files", the dialog will allow you to browse for files to upload just as you have before. However, if your browser supports it, you can now select multiple files by holding CTRL + clicking on the LOs you wish to upload. Once you have the file(s) you wish to upload in the panel, start the upload by clicking "Start Upload" on the bottom left. As the LOs get uploaded, the progress bar will update and the individual LOs will either return upload success or failure messages, followed by an itemized list of the LOs. If the upload was successful, the panel will show a green checkmark for that LO. If the upload was a failure, the panel will show a yellow alert icon for that LO. As before, if an upload failed, you will be given the reason why in the error message. 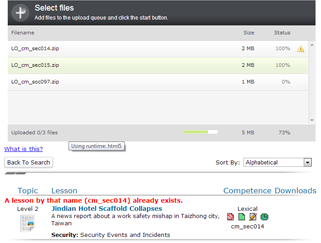 In this example, the lesson already exists and must be deleted before a new version can be uploaded. In the event that the upload was a success, you may continue as before by reviewing and/or publishing it.